Looking to rent in Toronto? Rent prices in the city seem to only go higher and higher. So how much does an apartment in Toronto really cost? While an upward trend has continued since 2000, the biggest single year increase for apartments was 2001’s 4.9% jump. 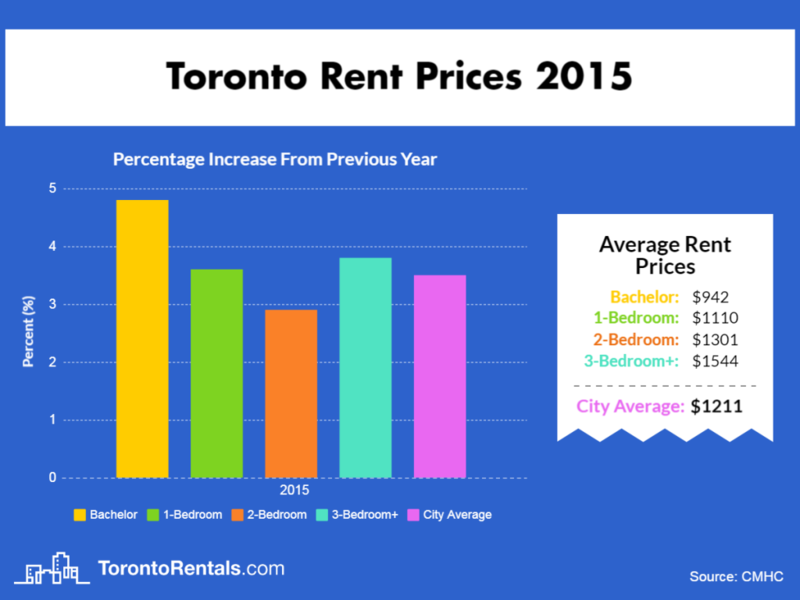 A variety of factors influence rent prices in Toronto. The major ones are vacancy rates, rent control guidelines, and most importantly Toronto’s housing market. Over the past decade, the housing market has been hotter than ever with housing prices increasing 33% between 2016 and 2017 alone. This causes a huge surge of demand in the rental market as many potential first-time home buyers are priced out of the market. There’s also a huge difference in rent prices between private apartments (buildings built with the purpose of being rented) and condominium apartments (apartments rented out by individual condo owners). The main reason for this is that current rent control laws only apply to units built or occupied before 1991, thus every condo built after 1991 is exempt and their owners are able to pass on huge increases to tenants. To explain just how much and why rent has gone up in Toronto over the last 17 years, we’ve compiled the CMHC’s data and summarized the major factors that influenced each year. As the CMHC tracks condo apartment rent prices separately from private apartment rent prices, we’ve displayed that data separately too. Note: The CMHC began reporting on condo apartment rent prices starting in 2006. In 2017, the average Toronto rent price climbed 6% to $1308, an increase well above the 1.5% provincial guideline. Are Toronto rent prices out of control? While current rent prices are the highest the city has ever seen, Toronto continues to be very affordable in comparison with other major North American cities. However, comparing wage growth over the past two decades to rent price growth tells a different story. 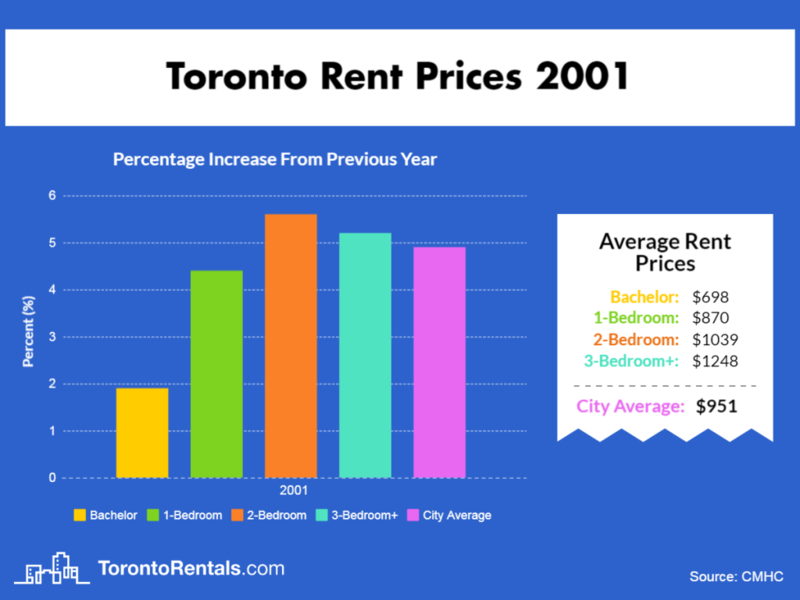 While rent prices have gone up almost 37% in Toronto since 2000, average wages have only increased 10% between 1998 and 2011 according to Statistics Canada. That means for the average Torontonian, continuing to live in Toronto has become alarming unaffordable. 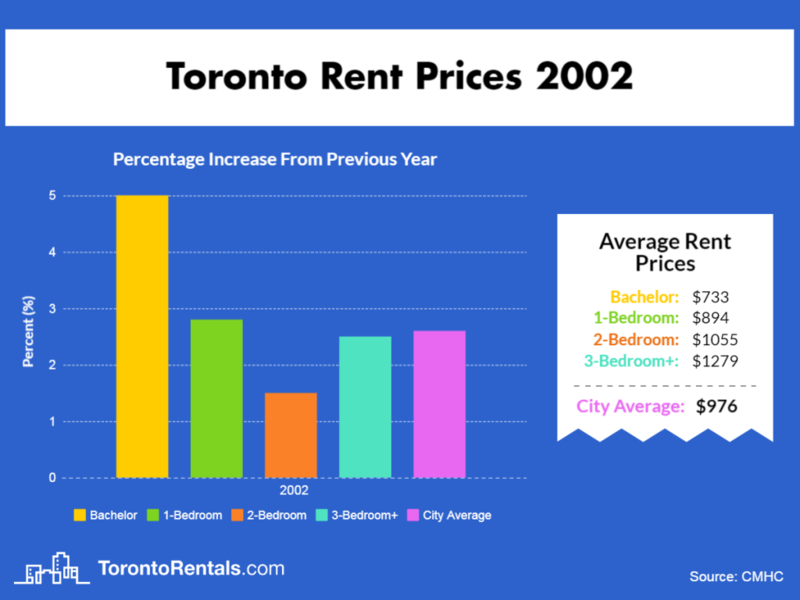 While rent prices have gone up almost 37% in Toronto since 2000, average wages have only increased 10% between 1998 and 2011 according to Statistics Canada. What is the impact of Ontario’s new “Fair Housing Plan”? As outlined by the Ministry of Finance, the Fair Housing Plan which came into effect April 20th, 2017 is a 16 point plan aimed at stabilizing the real estate market. Notably, it expands rent control to apply to all private rental units, as opposed to just ones built after 1991, and imposes a 15% tax on foreign purchases of Ontario properties. Rent control for all units should limit rent increases observed in the city, and any cooling of the housing market also makes the renting market more affordable. 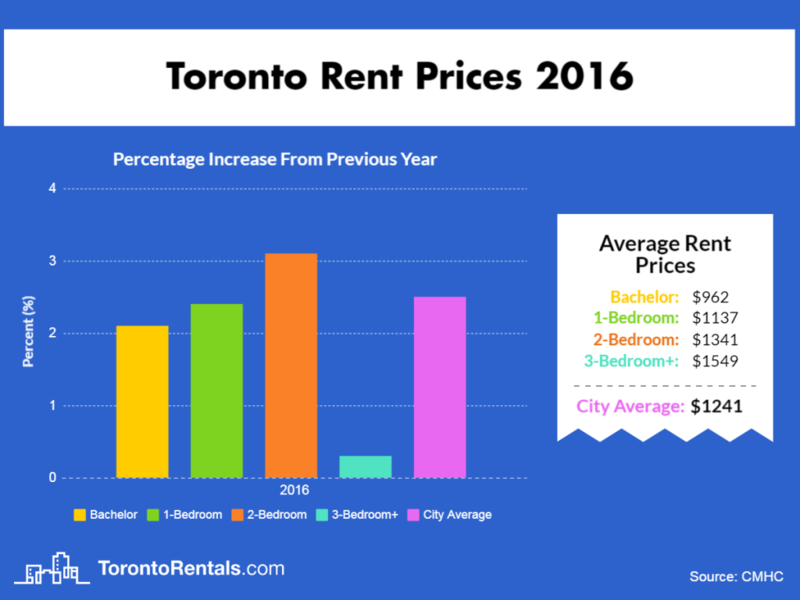 In 2016, the average Toronto rent price climbed 2.5% to $1241, an increase well above the 1.5% provincial guideline. The condo apartment market also saw growth, with a 5.8% rent increase from 2015. The factors that continued to keep the rental market tough for tenants were high homeownership costs, limited quantities of new rental buildings added to the market, and a strong Toronto job market. 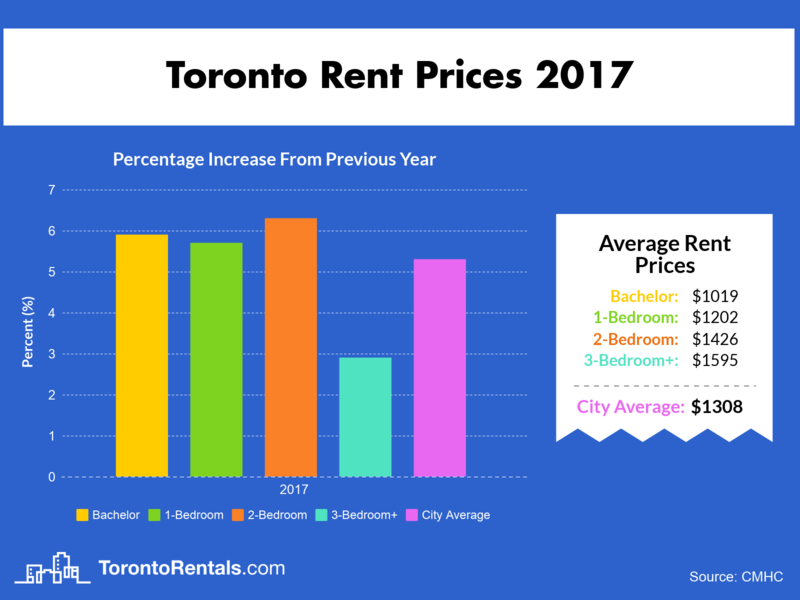 Average rent prices in Toronto increased 3.5% in 2015, the largest single year increase since 2001 (when prices rose 4.9% in a single year). For the condo apartment market, 2015 was another growth year with rent prices growing 7.6%. The CMHC attributed higher rent prices in both markets to growing wages in Toronto increasing the amount tenants were willing to pay. As well, Toronto’s hot housing market continued to price out many potential first-time buyers and increase rental demand, as many Torontonians instead opted to continue to rent. 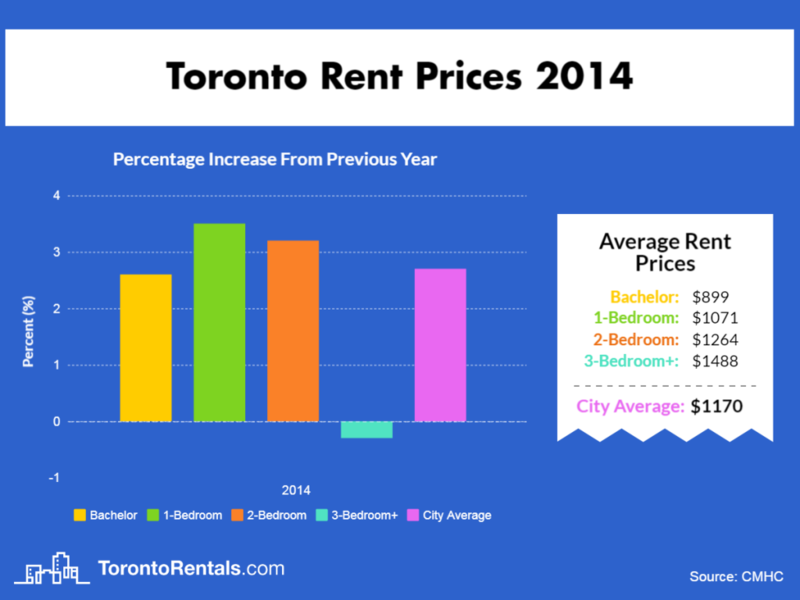 Toronto rent prices grew 2.8% in 2014, creating a city average of $1170. However, 3-bedroom+ units in fact dropped in price, decreasing 0.3% from 2013. Overall demand for rental units was fueled by high housing prices and sluggish wage increases, while 3-bedroom+ units continued to face steep competition from condo rental units and houses. While rent increases outpaced the provincial guideline of 0.8% in 2014, this guideline had dropped significantly from 2.5% in 2013. Condo apartments had a very stable year in 2014 with a 0.9% rent price increase, rebounding from an almost 14% increase in 2013. The CMHC noted that condo landlords faced competition from the high quantity of new units in recent years, and therefore avoided increases in order to remain competitive. 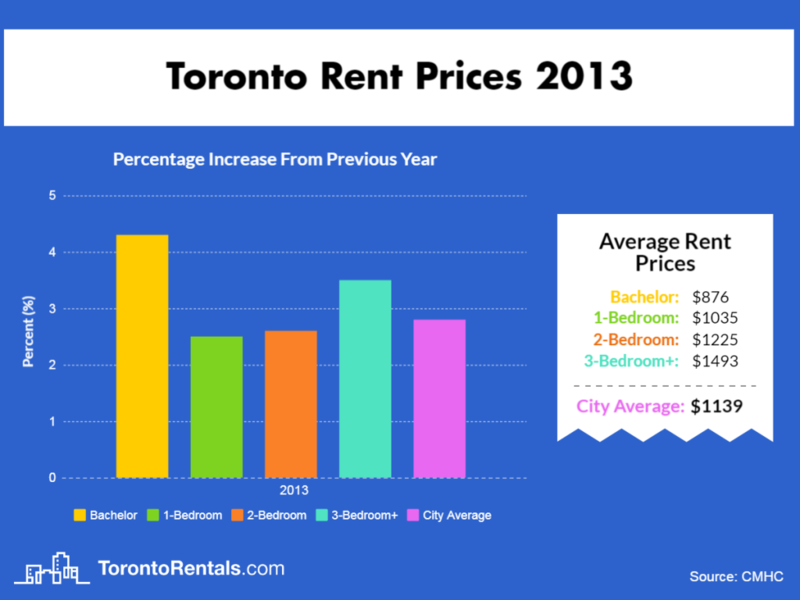 Rent prices continued to climb in 2013, increasing 2.8% to create a city average of $1139. The CMHC noted that strong youth employment figures boosted rental demand, with bachelor apartment rent prices climbing 4.3%. This is also the fourth year in a row that rent increases outpaced Ontario’s provincial increase guideline, indicating that high-priced new units and exceptions granted to landlords still dominate the market. For the condo apartment market, a 13.6% increase was witnessed in 2013. While this percentage is very high in comparison to the private apartment rental market, the CMHC noted that condo data is skewed by the entry of newly-completed units to the market each year. 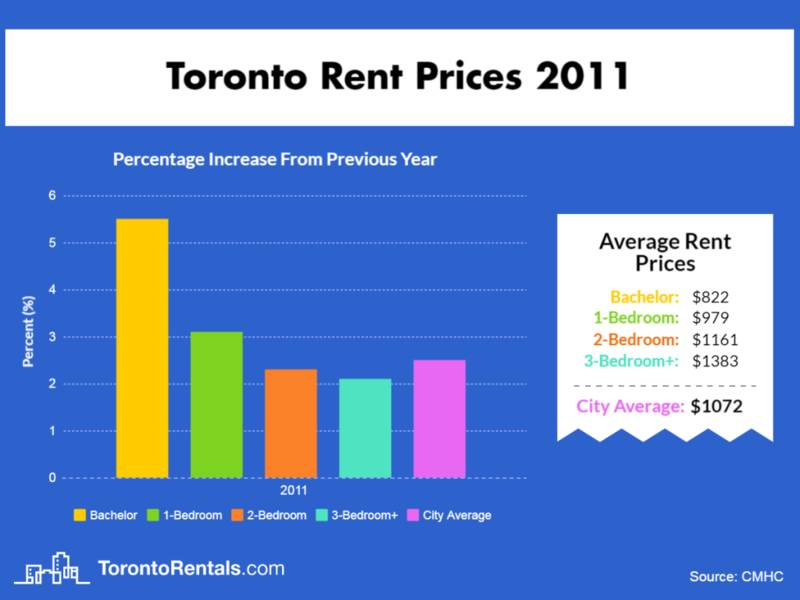 Rent prices in Toronto increased 3.4% in 2012 to become $1108, slightly exceeding the provincial guideline of 3.1%. 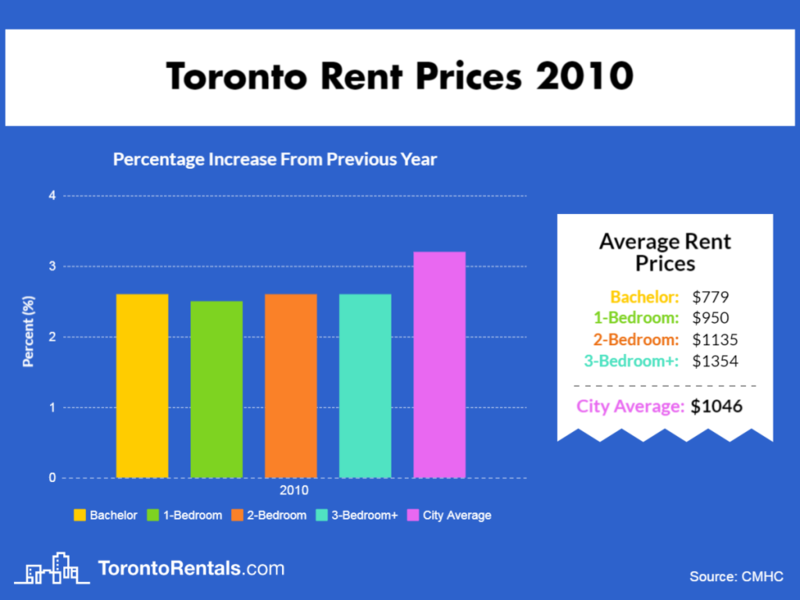 However, within the boundaries of the former city of Toronto, average rent prices climbed to $1212 which is 9.3% higher than the city average and 5.5% than they were in 2011. Heightened demand for downtown units is fueled by a growing 20-35 working demographic in the city. For condo apartments, a mild year was observed with a 1% rent increase from 2011, settling from the 7.5% increase observed in 2011. 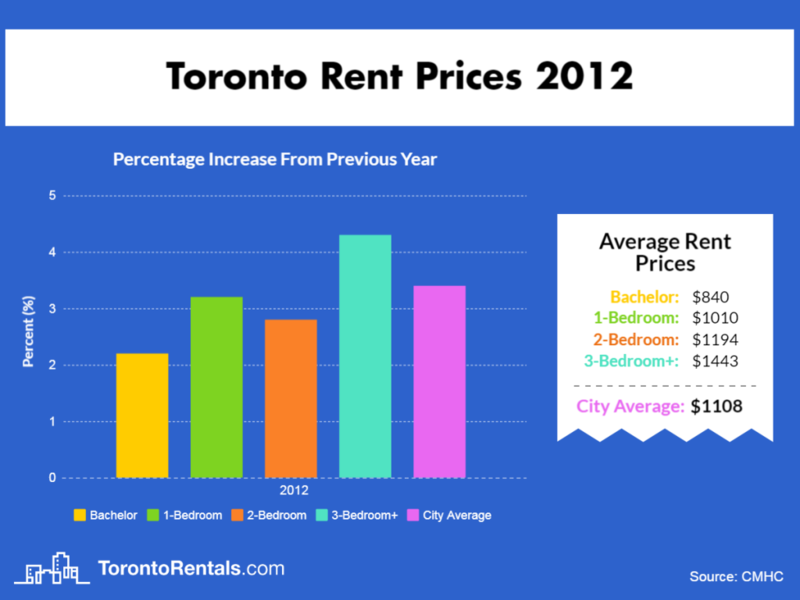 Citywide average rent prices climbed 2.5% in 2011 to make the average Toronto rent price $1072. However, bachelor rent prices alone climbed 5.5%. 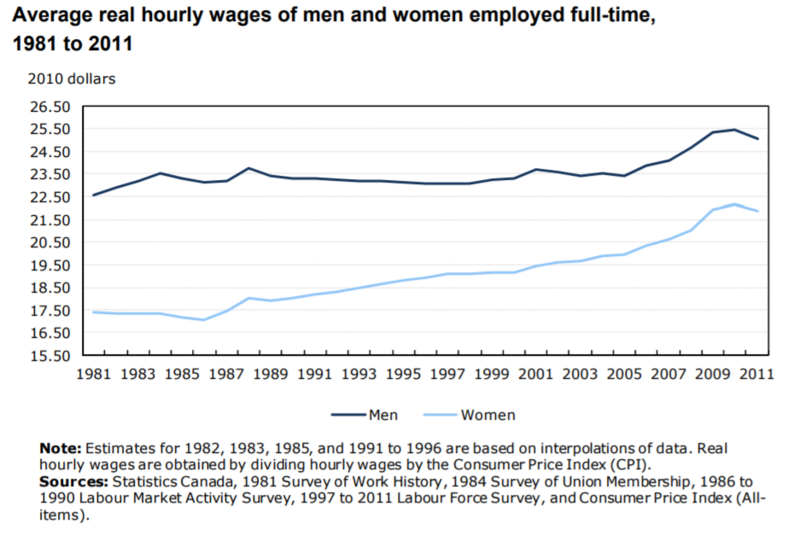 The CMHC attributed this to a growing 20-35 age demographic and an improved employment picture. They also noted that increased rent prices were a result of weaker homeownership demand from young people as renting continued to be the more affordable option. Meanwhile in the condo apartment market, rent prices dropped 7.5% in 2011, which is likely the market correcting itself from the remarkable increase observed in 2010. Toronto’s average rent price increased by 3.2% in 2010 to equal $1046, well above the provincial guideline increase of 2.1%. The CMHC attributed this increase to a widening gap between the costs of renting and owning a home that deterred many potential first-time home buyers. This lead to a saturated rental market which allowed landlords to raise their rent prices. Meanwhile, condo apartment rent prices soared 15.8% in 2010, as higher income tenants quickly rebounded from the 2008 recession. The CMHC noted that the introduction of HST in 2010 increased maintenance costs for condo owners, who passed on this cost to renters. 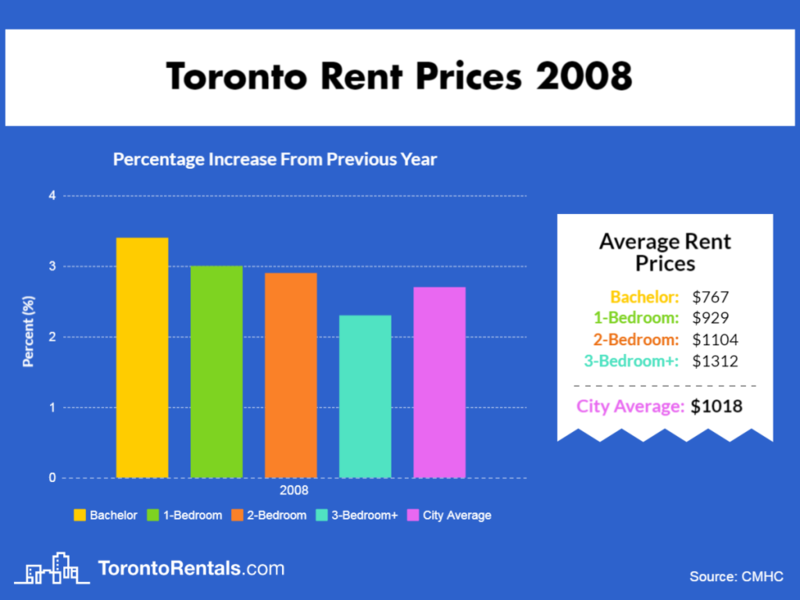 The average rent price in Toronto decreased by 0.4% for private apartments and 5.8% for condo apartments in 2009 as Torontonians continued to recover from the 2008 recession. 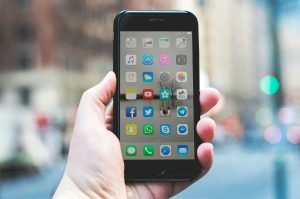 Rent demand dropped due to higher unemployment rates and tough economic times resulting in more youth staying at home longer instead of renting, according to the CMHC. Toronto’s average rent price for both private apartments and condo apartments went up 2.7% in 2008. For private apartments, this brought the average rent price to $1018, which is the first time this average has exceeded $1000.The CMHC noted that rental demand increased this year due to higher unemployment rates due to the recession. Hard economic times prevent potential homeowners from affording housing and keeps renters renting longer. The CMHC changed its method of calculating average rent in 2007 to only include rental properties that also existed the year before. Thus, while their published private apartment rent average is 0.4% lower in 2007 than it was in 2006, this can be attributed to their methodology change as brand new units typically have higher rent prices than their older counterparts. On the other hand, condo apartment rents went up 2.3% in 2007, making 2007 a relatively stable year in the hot condo market. 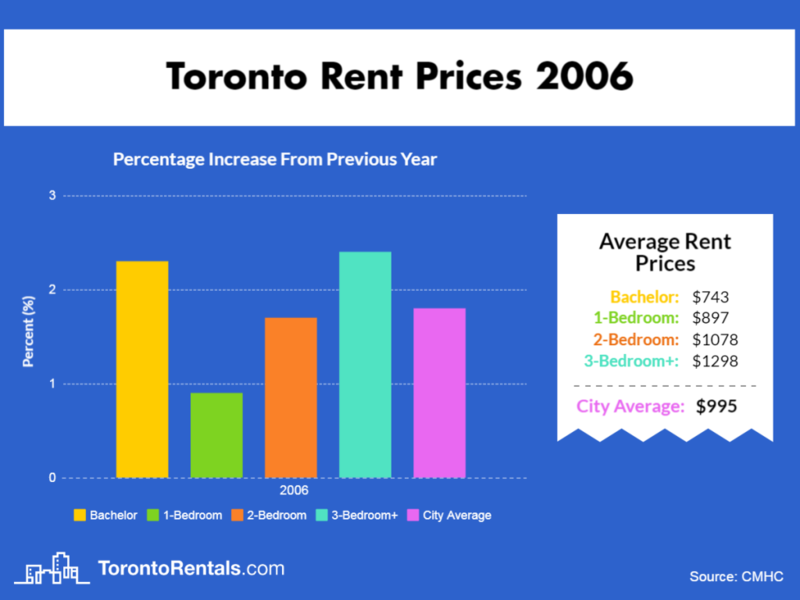 A 1.8% increase in rent prices was observed in Toronto for 2006, reflecting lower vacancy rates and higher mortgage rates. This increase was higher than the provincial guideline but below inflation levels for 2006. The CMHC also noted that a recovery youth unemployment rate and increased immigration also contributed to higher rental demand and rent prices. Additionally, 2006 marks the first year the CMHC published condo apartment data for, which they refer to as the secondary rental market. They estimate the GTA had over 200 000 condo apartments in 2006, making them an important presence in the market. 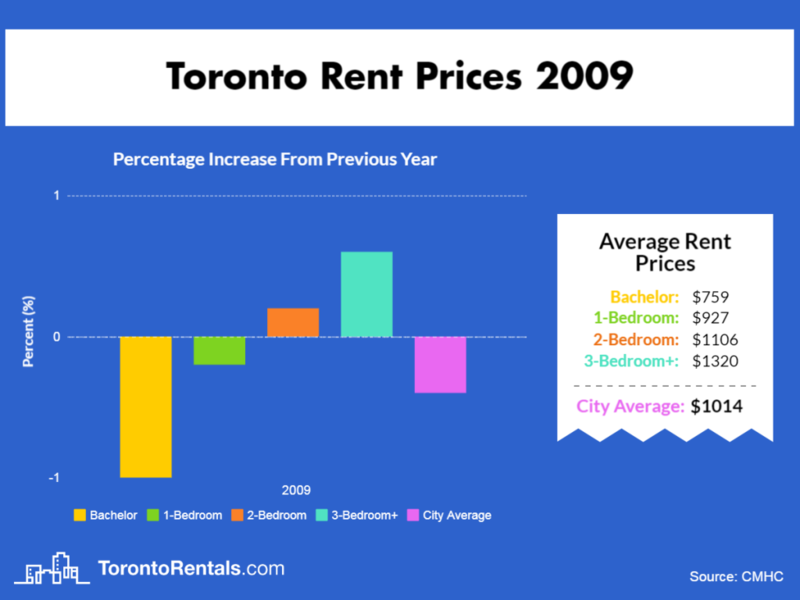 Rent prices on average increased slightly in 2005, climbing 0.4% to $977. This is the third year in a row rent prices increased at a rate below the provincial guideline and inflation rate. The CMHC also noted that minimal rent increases were tied to landlords resorting to offering incentives such as free first-month rent and free parking in order to offset vacancy rates and fill their units. The rental market continues to face tough competition from homeownership with low mortgage rates encouraging renters to purchase homes. 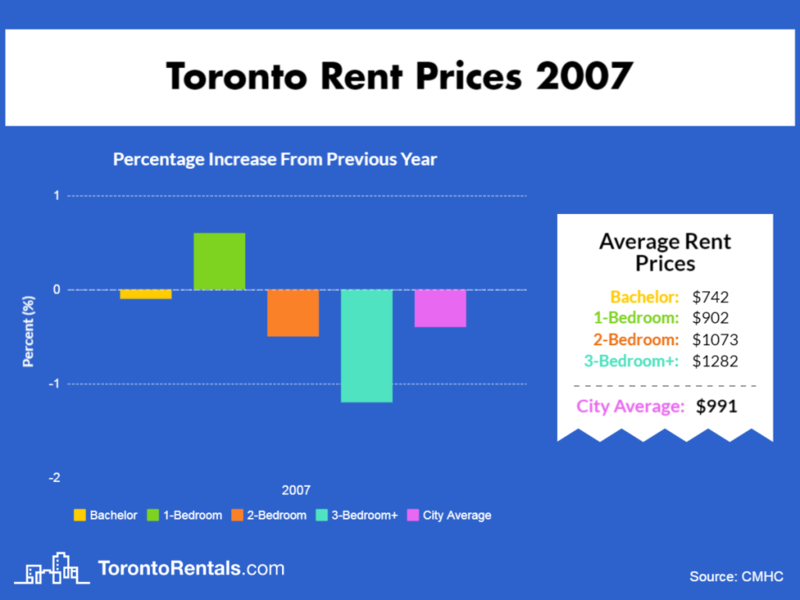 Toronto’s average rent price went up 1.2% in 2004, recovering from it’s 1.5% drop the previous year to equal $973. The tough rental market for landlords was attributed to increasing vacancy rates, with 2004 having the highest citywide vacancy rate ever recorded at 4.4%. The CMHC also noted that the secondary rental market, which includes condos rented out to tenants by private owners, had extremely competitive rent prices in 2004 which contributed to high vacancies rates and low rent prices. 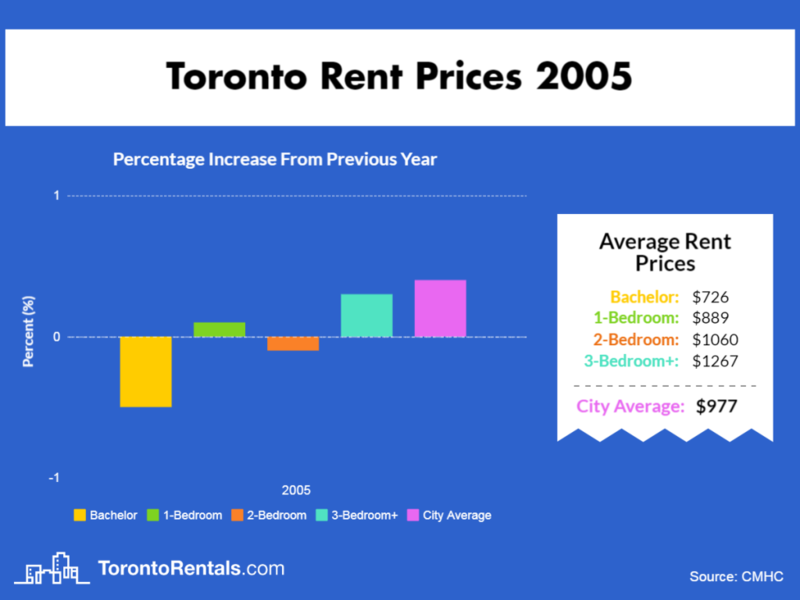 Rent prices across Toronto dropped by an average of 1.5% in 2003 to equal $961. This drop is directly linked to record high vacancy rates of 3.8% in 2003 forcing landlords to lower rents to fill units. The rental market continues to see steep competition from condominiums and low mortgage rates this year. 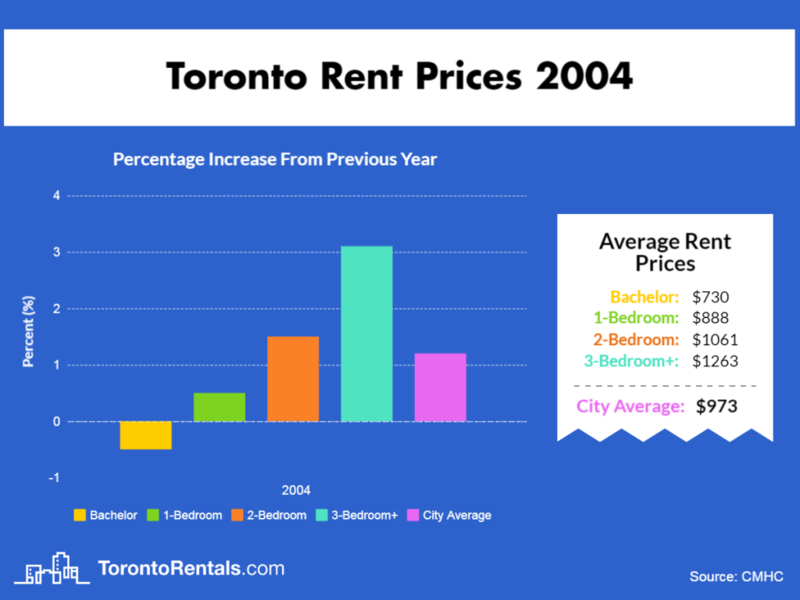 Average rent prices in Toronto increased by 2.6% in 2002 to be $976, down from a 4.9% increase in 2001. This increase fell below the provincial guideline for 2002 of 3.9% and the CMHC attributed the limited increases in rent to upward trending vacancies rates across the city due to low mortgage rates. 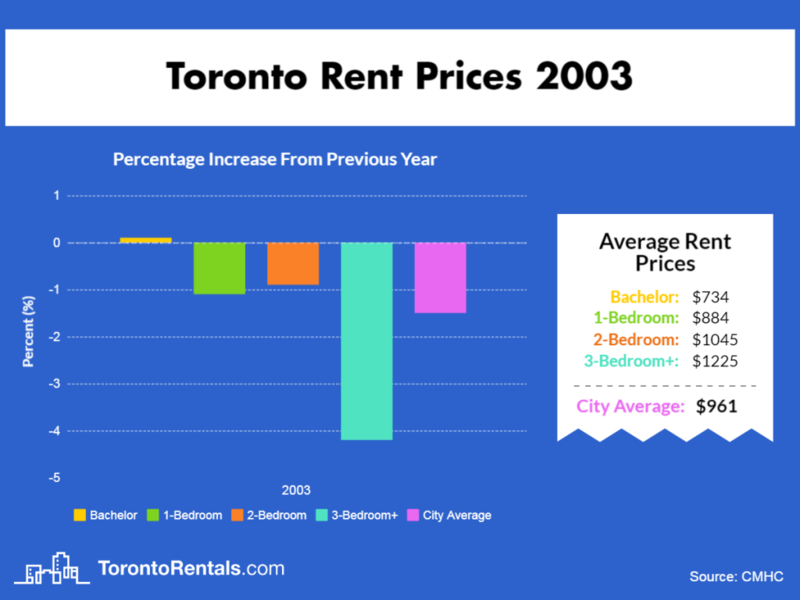 Toronto’s average rent price went up 4.9% in 2001, exceeding the inflation rate and Ontario’s 2.9% increase guideline that year. However this increase is 2.6% lower than the previous year’s increase and the CMHC attributed that to low homeownership costs preventing landlords from raising rents without creating vacancies. At the beginning of the century, Toronto’s average rent was $907. While that is approximately 37% lower than rent prices today, it was a dramatic 7.5% higher than 1999’s average. This was due to the aftermath of the Tenant Protection Act (TPA) passed by the Harris government in 1998, which championed relaxed rent control. 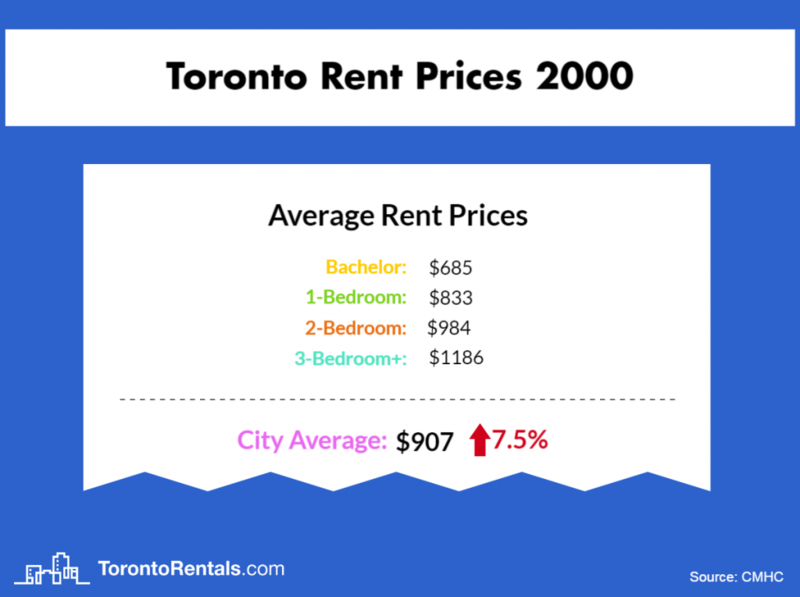 Toronto’s rent prices were also much higher than other Canadian cities back in 2000, with Montreal’s average rent price at nearly half of Toronto’s and Vancouver’s being 17% lower. 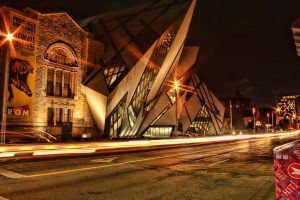 Unique Ways to Party This Halloween in Toronto!